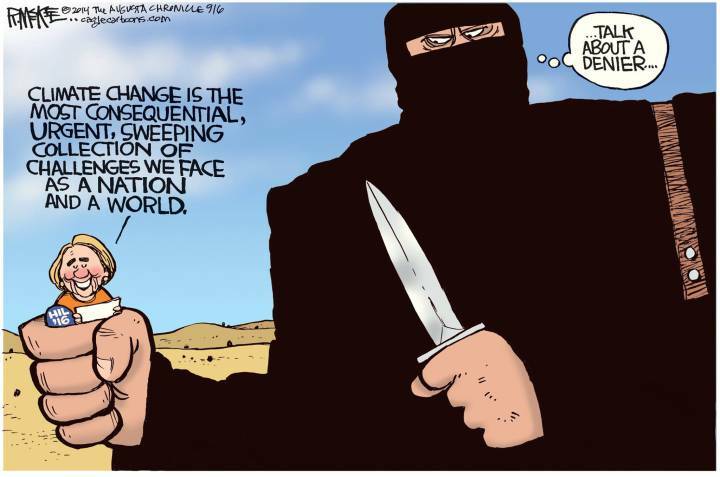 Rick McKee, editorial cartoonist for the Augusta Chronicle, sends me this political cartoon about climate change which he posted on his Facebook page and the WUWT Facebook page. It sums up perfectly what is wrong with our current political leadership: they are more worried about climate change than they are immediate threats with a clear and present danger. According to Breitbart, Hillary Clinton made the comments at a recent paid for speaking engagement in Las Vegas. I guess when you get that kind of money, you’ll say anything for hire. The topic is explosive, not so much for the climate change part, but for the other two elements in it. Commenters should be be warned that we’ll snip any inappropriate comments.